The Global Volcanism Program has no activity reports for Bibinoi. The Global Volcanism Program has no Weekly Reports available for Bibinoi. The Global Volcanism Program has no Bulletin Reports available for Bibinoi. Bukit Bibinoi (Bibinoi Hill) is the largest and SE-most of a group of three andesitic Holocene stratovolcanoes located along a NW-SE line near the SE tip of Bacan Island, west of the southern tip of Halmahera (Yasin, 1980). The smaller Songa and Lansa volcanoes straddle a narrow isthmus separating the SE-most peninsula of Bacan Island from the Sibela Mountains metamorphic complex. The group lies along the same trend as the Amasing volcano group, located to the NW on the other side of the Sibela Mountains. Sundhoro H, Sulaeman B, Rezky Y, 2010. Geothermal Fluids Beneath The Songa – Wayaua Area, Bacan Island, North Maluku Province - Indonesia. Proceedings World Geothermal Congress 2010. Bali, Indonesia, 25-29 April 2010. Yasin A, 1980. Geologic map of the Bacan quadrangle, north Makalu. Geol Res Devel Centre Indonesia, 1:250,000 scale map and 10 p text. The Global Volcanism Program is not aware of any Holocene eruptions from Bibinoi. If this volcano has had large eruptions (VEI >= 4) prior to 10,000 years ago, information might be found on the Bibinoi page in the LaMEVE (Large Magnitude Explosive Volcanic Eruptions) database, a part of the Volcano Global Risk Identification and Analysis Project (VOGRIPA). There is no Deformation History data available for Bibinoi. There is no Emissions History data available for Bibinoi. 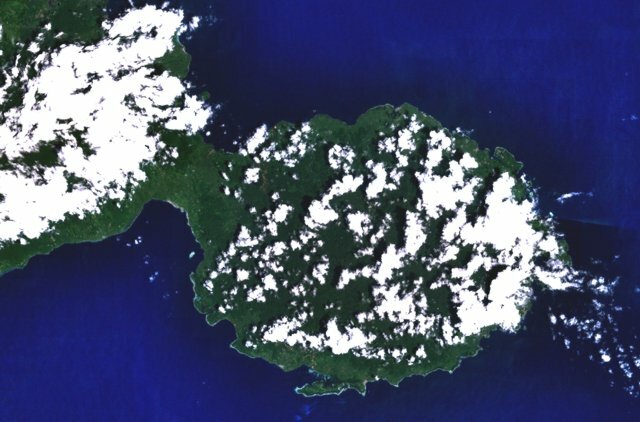 The peninsula in the center of this NASA Landsat image (with north to the top) forms the SE tip of Bacan Island, west of the southern tip of Halmahera. Bukit Bibinoi (Bibinoi Hill) is the largest and SE-most of a group of three andesitic Holocene stratovolcanoes located along a NW-SE line on the peninsula. The smaller Songsu and Lansa volcanoes straddle a narrow isthmus (left center) separating the peninsula from the Sibela Mountains metamorphic complex to the NW. The Global Volcanism Program has no maps available for Bibinoi. There are no samples for Bibinoi in the Smithsonian's NMNH Department of Mineral Sciences Rock and Ore collection. Large Eruptions of Bibinoi Information about large Quaternary eruptions (VEI >= 4) is cataloged in the Large Magnitude Explosive Volcanic Eruptions (LaMEVE) database of the Volcano Global Risk Identification and Analysis Project (VOGRIPA).